Our passion and expertise are put to work for our clients each and every day as we provide custom seed cleaning, grower contracting, and much more. We custom process sunflowers, soybeans and wheat for edibles, seed and feed. Our AIB-certified plant is equipped with a Sortex color sorter with shape recognition to ensure a quality product. 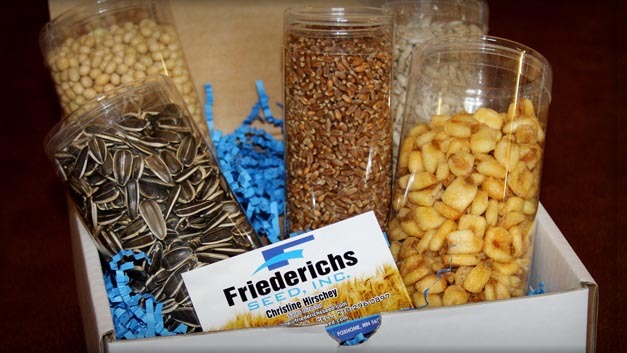 Please contact us today to learn how Friederichs can assist with all your seed cleaning needs. Our facility is AIB Certified, Kosher Certified, MCI Certified, NDSSD Certified and utilizes HACCP standards to ensure the high quality products our customers expect. We offer an extensive line of soybean, sunflower and wheat varieties to meet your ingredient or snack needs. Custom roasting options for sunflower seeds is also available. For more than a century, Friederichs Seed Farm has specialized in registered seed sales and conditioning. With this rich heritage as our foundation, we look to the future as we continue to grow and seek new opportunities to better serve the needs of our customers. Want to learn more about our family-owned operation?